Founder of the Society for Ethical Culture, educator, and author; second son of Rabbi Samuel Adler; was born at Alzey, Germany, Aug. 13, 1851. In 1857, when his father received a call to the ministry of Temple Emanu-El at New York, the family came to that city. 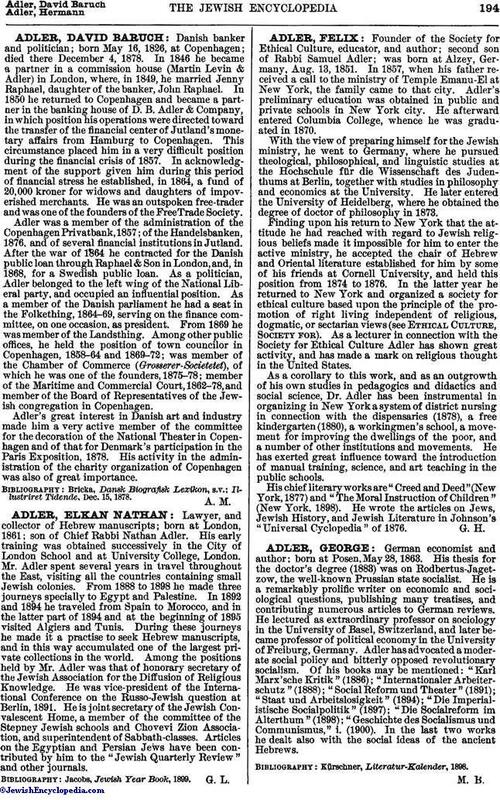 Adler's preliminary education was obtained in public and private schools in New York city. He afterward entered Columbia College, whence he was graduated in 1870. With the view of preparing himself for the Jewish ministry, he went to Germany, where he pursued theological, philosophical, and linguistic studies at the Hochschule für die Wissenschaft des Judenthums at Berlin, together with studies in philosophy and economics at the University. He later entered the University of Heidelberg, where he obtained the degree of doctor of philosophy in 1873. Finding upon his return to New York that the attitude he had reached with regard to Jewish religious beliefs made it impossible for him to enter the active ministry, he accepted the chair of Hebrew and Oriental literature established for him by some of his friends at Cornell University, and held this position from 1874 to 1876. In the latter year he returned to New York and organized a society for ethical culture based upon the principle of the promotion of right living independent of religious, dogmatic, or sectarian views (see Ethical Culture, Society for). As a lecturer in connection with the Society for Ethical Culture Adler has shown great activity, and has made a mark on religious thought in the United States. As a corollary to this work, and as an outgrowth of his own studies in pedagogics and didactics and social science, Dr. Adler has been instrumental in organizing in New York a system of district nursing in connection with the dispensaries (1878), a free kindergarten (1880), a workingmen's school, a movement for improving the dwellings of the poor, and a number of other institutions and movements. He has exerted great influence toward the introduction of manual training, science, and art teaching in the public schools. His chief literary works are "Creed and Deed"(New York, 1877) and "The Moral Instruction of Children" (New York, 1898). He wrote the articles on Jews, Jewish History, and Jewish Literature in Johnson's "Universal Cyclopedia" of 1876.